Other name: Arroche Puante, Chénopode Fétide, Chénopode Puant, Arrach, Dog's Arrach, Goat's Arrach, Goosefoot, Herbe de Bouc, Netchweed, Oraches, Stinking Arrach, Stinking Goosefoot, Stinking Motherwort, Vulvaire. Wild Arrach stem is not erect, but partly Iying, branched from the base, the opposite branches spreading widely, a foot or more in length. The stalked leaves are oval, wedge-shaped at the base, about 1/2 inch long, the margins entire. The small, insignificant green flowers are borne in spikes from the axils of the leaves and consist of five sepals, five stamens and a pistil with two styles. There are no petals and the flowers are wind-fertilized. They are in bloom from August to October. The whole plant is covered with a white, greasy mealiness, giving it a grey-green appearance which when touched, gives out a very objectionable and enduring odour, like that of stale salt fish, can be easily identified by its rotten-fish smell that is due to its trimethylamine content, and accounts for its common popular name: Stinking Goosefoot. Wild Arrach is a hardy perennial plant native to the mountainous regions of Europe, North America and Asia. The cultivated variety has been eaten traditionally as a substitute for spinach, but the wild variety is thought to have more medicinal value. English herbalists have considered it useful in preventing / alleviating ailments related to pregnancy and childbirth. The name of 'Stinking Motherwort' refers to the use of its leaves in hysteria and nervous troubles connected with women's ailments: it has emmenagogue and anti-spasmodic properties. In former days, Wild Arrach was supposed even to cure barrenness, promotes and moderates the menses and in certain cases, the mere smelling of its foetid odour was held to afford relief. However the traditional uses for this herbs have not been confirmed by medical science. Wild arrach is not recommended in pregnant or breastfeeding women due to a lack of available scientific evidence. 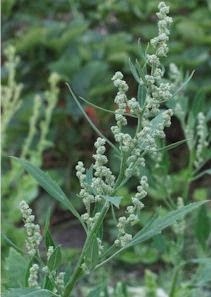 Known hazards of Chenopodium vulvaria: The leaves and seeds of all members of this genus are more or less edible. However, many of the species in this genus contain saponins, though usually in quantities too small to do any harm. Although toxic, saponins are poorly absorbed by the body and most pass straight through without any problem. They are also broken down to a large extent in the cooking process. Saponins are found in many foods, such as some beans. Saponins are much more toxic to some creatures, such as fish, and hunting tribes have traditionally put large quantities of them in streams, lakes etc in order to stupefy or kill the fish. The plants also contain some oxalic acid, which in large quantities can lock up some of the nutrients in the food. However, even considering this, they are very nutritious vegetables in reasonable quantities. Cooking the plants will reduce their content of oxalic acid. People with a tendency to rheumatism, arthritis, gout, kidney stones or hyperacidity should take especial caution if including this plant in their diet since it can aggravate their condition. Note: Do not use wild arrach for any use, medicinal or otherwise, without first consulting a qualified doctor.